Travel into the mountain valleys of Chopta, deep in the interiors of Uttarakhand, and stay in Swiss tents pitched over a picturesque hillside. You can explore the village of Chopta or admire unfiltered views of mountain peaks that rest at your doorstep. At an additional cost, you can even go on guided treks to nearby destinations such as the Chandrashila peak, the Tungnath temple or Deoriatal Lake. At night, you'll warm your hands around a crackling bonfire, under a blanket of stars, and wake up to misty mountain views of a Himalayan sunrise. NOTE: Price displayed are for weekday nights. Please check the Fine Print section below to view prices of weekend nights. Chopta, perched atop the mountains at 8,790 ft, is a small area of evergreen forests and vast meadows, inside the Kedarnath Wildlife Sanctuary. As the base camp for several short treks, the trails around Chopta offer views of towering mountains like Nanda Devi, Chaukhamba and Trishul. 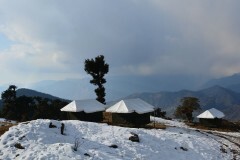 In the months of winter, the snow covered landscape of Chopta has earned it the nickname 'Mini Switzerland'. Your campsite, perfect for an escape into the Himalayas, offers stay at Swiss tents that come with attached washrooms, comfortable beds and blankets to ensure a restful night’s sleep. • Spend a night camping at Chopta. • Catch breathtaking views of snow-capped mountain peaks of the Himalayas. • Explore the Chopta village and Kedarnath Wildlife Sanctuary. A basic level of health and fitness is required to book this camping trip in Chopta. This is a non-strenuous activity. However, if you have any cardiac or respiratory conditions, or suffer from knee or spinal problems, please consult your doctor before booking this trip. Travellers are required to adhere to the instructions of the tour leader while undertaking any adventure activity during the camping trip in Chopta. Cancellations made more than 30 days before check-in date of Chopta camping trip: 100% refund. Cancellations made on or less than 30 days before check-in date of Chopta camping trip: No refund. Check-in time for the campsite is 11:00 hrs and check-out time for the campsite is 12:00 hrs. Accommodation for children younger than 10 years of age is charged at a discounted price of INR 1,200 per weekday night, and INR 1,500 per weekend night. Accommodation for children older than 10 years of age is charged at full price. Price displayed is for a weekday stay. Weekend stays will be charged at INR 2,500 per weekend night. Non-vegetarian food can be provided only if requested a minimum of 7 days in advance. Arrive at the campsite in Chopta by 11:00 hrs and check-in to you allotted deluxe tents. You can spend the rest of the day at leisure. Take some time to rest and go on a walk around the campsite. Admire the incredible natural beauty of the towering mountains surrounding the campsite. At an extra cost, you can even embark on treks to nearby destinations of Chandrashila, Deoriatal or Tungnath. In the evening, subject to good weather conditions, you'll gather around a bonfire and have fun with your fellow campers, friends or family. 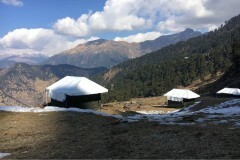 Overnight at Chopta in tents. Mountains of Uttarakhand from the campsite at Chopta. Wake up early morning and spend some time meditating in the cool, morning breeze. Post breakfast, check-out of the campsite by 12:00 hrs. Depending on availability, you can even extend your stay at the campsite. Your trip ends here. Wake up to morning mountain views of the valley. Overnight at Chopta in tents. You will be accommodated in deluxe Swiss tents on a twin sharing basis. Your tents will come with attached washrooms, comfortable beds with blankets and pillows. Today's meal package includes vegetarian lunch and dinner. You will also be served tea/coffee in the evening. Today's package includes breakfast before check-out at 12:00 hrs. You can take a flight to Dehradun's Jolly Grant Airport and travel to the campsite via road, located 6-hr drive away from the airport.